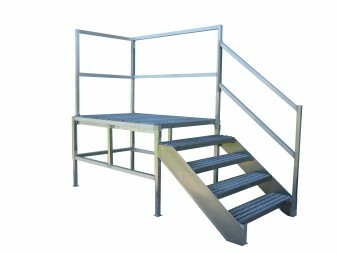 The Dura-Grip OSHA Stair is designed for construction trailers and field offices that need to meet OSHA regulations. You can easily assemble and adjust these stairs according to the threshold and necessary configuration. REDD Team aluminum stairs provide OSHA compliant access to modular buildings, construction trailers, and temporary offices. Easily assembled in less than ten minutes.